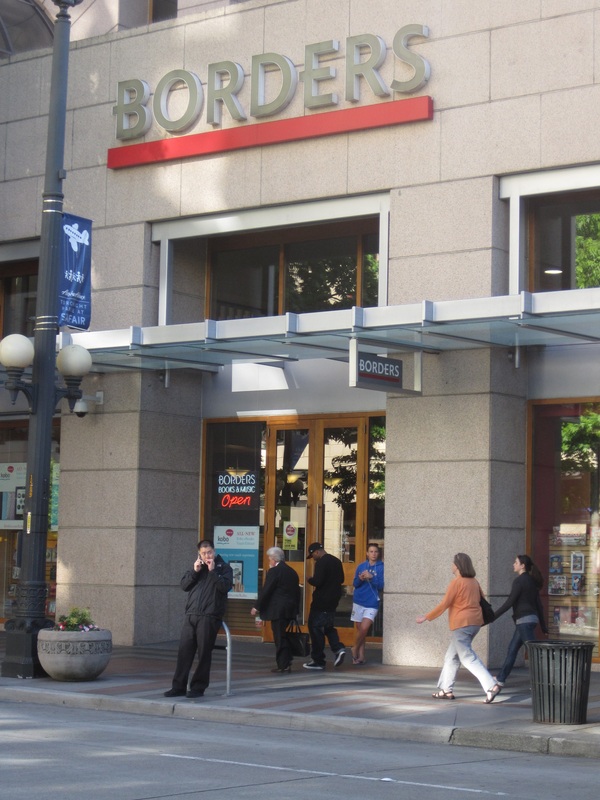 When I moved to Seattle about 14 years ago, I discovered the Borders in downtown between Pike and Pine on 4th. While I still hit up Elliot Bay Book Company for book browsing, or maybe one of the small indie stores for CD’s, Borders had it all! And it was right there, in the heart of everything. It was my primary shopping destination when I was looking for media. And every Christmas, I put together my list and did most of my shopping there. Just over a month ago, I went to Borders downtown when I had some time to kill before going to meet someone after work. I spent $25 and change on a journal and a book. It was the first time I had spent any money in a Borders in possibly five years. Borders announced today that it was closing its doors for good today, shuttering the final 399 stores and laying off over 10,000 people. And I’m part of the reason why. I’m sorry, Borders. It really isn’t you. It was me. I’m no longer a “destination shopper.” The idea of going somewhere to browse has become alien to me. I no longer the desire to browse shelves and tables looking for something interesting. When I wanted a book, I wanted something fairly specific. And I had too many failed attempts trying to find that obscure book that you didn’t carry. But Amazon did. More than that, Amazon generally had it cheaper than if I had to special order it from you. And I wouldn’t have to make a special trip to come pick it up. Plus, they gave me the incentive to spend a bit more by giving me free shipping above a certain amount. And they would hold onto a list of all the stuff I wanted to get but didn’t have the money for just then. Why would I go to Borders? Nostalgia? For a chain box store with 100’s of locations? Get real! So I’m taking ownership of it. Borders, you are dead because of me and the millions like me who changed the way we shopped. Just like we changed how we shopped for music (Good by, Musicland Group and Tower Records). Just like we changed how we shopped for movie rentals (See ya later, Blockbuster). New media has learned this lesson over and over, so have a seat and hand the reins over to the next wave. You tried to be nimble and adapt. I’ll give you that. But you were burdened down by huge stores with huge overheads and a dwindling share of the marketplace. Maybe this will make you feel better: if the companies that drove the box stores out of business don’t continue to adapt and grow, they’ll be right were you are in a decade. You hear that, Amazon, Netflix, and iTunes? The future is coming for you. It always is. I’m truly sorry for all the people who have lost jobs. This is a tough time to be out of work. But I can’t imagine you’re too surprised, either. I’ve been on the inside of a sinking ship before. I know what it’s like. If you didn’t already have applications out at anywhere that was hiring, then you had more hope than I can wrap my head around. So tonight, I’m going to read myself to sleep with the last book I will ever purchase at a Borders. It is Procession of the Dead by Darren Shan. If there is a more prophetic book bought on accident, I’d love to hear it.